If you're having trouble viewing this message, view open it in a browser window. 2015 was a year of change and transition – locally, provincially, nationally and around the world. With every new year comes a chance for new beginnings, resolutions and opportunity. If you are thinking about starting a new home-based business, we have a list of resources for you to help set you up for success. If one of your resolutions is to spend more time with family and get more exercise, a backyard rink would be a great way to do both. 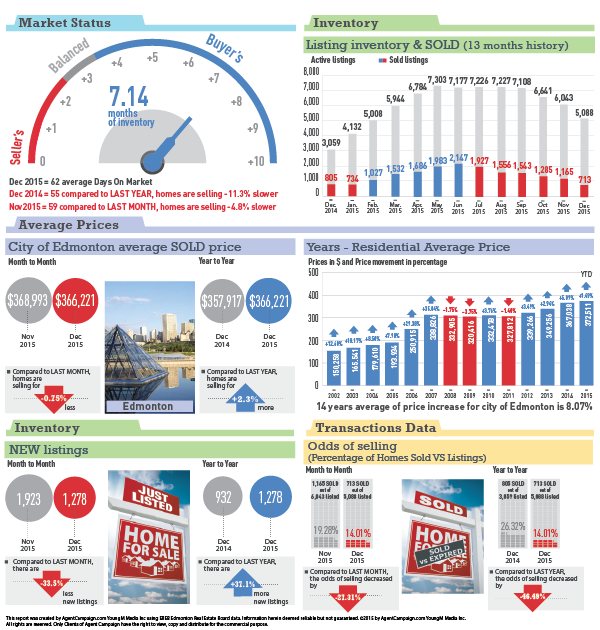 We have also provide an infographic that depicts the local real estate market over the past few years to give you a sense of where we are at today. We wish you a happy, healthy and prosperous 2016. If you, your friends or family are looking to buy or sell real estate please keep me in mind. Your referral is the best compliment I can receive. Forget that long commute and the structured 9-5 work day. Make it a thing of the past by starting up your own home-based business, where you can work at home and be your own boss. More and more people are leaving the office setting behind for the comfort of their own home. Two types of home-based businesses allowed in Edmonton. Minor Home-Based Businesses are those that are considered to have no impact on the neighbours and are basically invisible. Typical businesses would be consultants, computer programmers and other service-oriented businesses where the proprietor goes to the customer rather than the customer coming to the home. • There cannot be more than one visit to your home each day because of your business. • There cannot be any non-resident employees or business partners working on-site at any time. • Your business cannot change the principal character or external appearance of the residential property. Major Home-Based Businesses are those businesses that are visible and may involve the customer coming to the home or some other use of the property that is not typical of a residential area. Major home occupations will allow more business visits and also allow you to have employees. Typical businesses are hair dressers or lawn maintenance companies. • There can be more than one visit to your home each day because of your business. • There can only be two non-resident employees or business partners working on-site any one time. • No outdoor business activity, or outdoor storage of material or equipment associated with the business is allowed. • This type of business can not be located in homes that have a secondary suite. Nothing is more Canadian than passing the time of a long, cold winter on a backyard ice rink. Sadly, there is a perception homemade rinks are difficult to make and even harder to maintain. Now with an array of products and how to videos available online, now it can be a simple project well worth a little effort for a ton of fun. How big of a rink do you want and where will you put it? 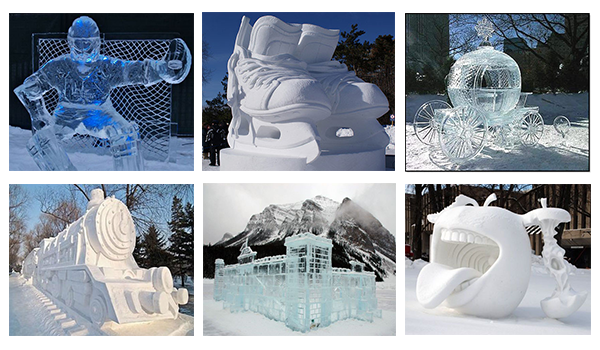 The bigger the rink, the more the materials and costs. Take measurements of your backyard and outline the shape and size you want. Check your slope and know for sure where your water line will be when you fill. This is the single most important step to building a rink. Even the slightest slope can lead to complications down the road. Will you use a plastic liner? You can flood your rink without a liner and you will get good ice with just a little more work. However, placing a plastic liner saves you a lot of time initially and later in maintenance. The liner holds the water so you can flood your rink as soon as the temperature permits with or without snow. A white liner is important as a dark colored one will absorb more sunlight/heat and melt the ice quicker. Will you put up rink boards? 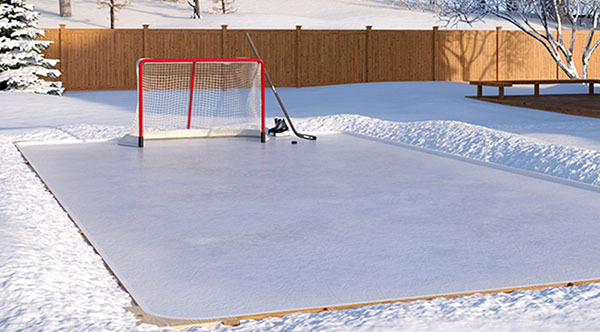 You can make a great outdoor ice rink surface without rink boards, but having boards makes it much more fun and it saves lots of time hunting for pucks that get lost in a snow perimeter. Rink boards also make flooding your rink easier with a wall to contain the water. Brackets and boards can be purchased from a backyard rink company or improvised from your local hardware store. Sources of electricity and water? Without lighting, the amount of rink use on short winter days is drastically reduced. Hang a string of Christmas lights or a couple of flood lights and extension cords. Make sure a water source is close by to fill the rink with water and maintain it through the season. Remember to drain the outdoor tap and bring the hose indoors after each use to prevent them from freezing. Here’s a list of some better websites we’ve found that offer DIY step by step instructions or one-stop shops that supply complete kits for purchase. 2015 was our best year ever thanks to YOU! We helped 59 families FIND & SELL their homes in the city we love. More important than the numbers are the people we've helped and the friends we've made. Thank you for putting your trust in our team and for spreading the word. Your referrals mean everything!